Editor's Note: This is the first of a three-part series by the author. To read part two, click here. To read part three, click here. Ninety-seven percent of the land in Texas is privately owned. It is regularly acknowledged that increasing fragmentation of private lands is one of the greatest threats to the sound management of our natural resources, including ground and surface water, wildlife habitat, and the farms, rangelands, and forests that produce our food and fiber. Landowning families experience intense pressure to divide their land into smaller and smaller parcels or to sell their land for development or other purposes, which result in the decline of ecological diversity and healthy functioning of the natural communities that sustain us all, whether we happen to live in, rural, urban, or suburban Texas. For the past thirty years, I have managed my family’s ranchlands on the eastern and western edges of the Texas Hill Country and in the Davis Mountains of the Trans-Pecos. My maternal grandparents Fred and Vera Shield acquired this land between 1938 and 1950. Like landowning families across the state, we have faced inevitable challenges from within and from without. Strategic planning, opportunities in emerging markets for ecosystem services, and a diverse array of partnerships and collaborations have enabled us to continue to own and steward our land together. 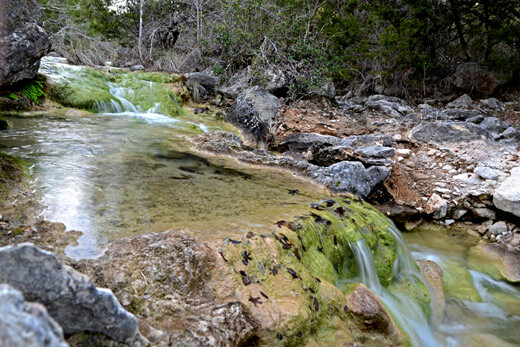 Our 6,800-acre ranch in Southwestern Travis County lies in the path of Austin’s explosive growth. Thirty years ago, in recognition of the changes and challenges that were coming our way, my mother, my sister and I, together with our spouses, gathered at the ranch to begin a strategic visioning and master planning process which laid the foundation for our future conservation efforts. We engaged professionals to create an inventory of the geologic, hydrologic, and topographic features of the ranch; its flora and fauna; and its prehistoric and historic cultural resources. They mapped existing development and regional infrastructure including parks and open space, as well as what was known about future projects. And they helped us explore and document our interests, desires, and dreams for the ranch. Through these conversations, it became clear that our common objective was to protect the unique features of the ranch as an ecological and cultural resource. We also recognized the value of the ranch as a significant financial asset. In the years that followed, we modified our grazing, hunting, and brush management programs to enhance wildlife habitat for both game and non-game species. We restored a settlement-era cabin. We learned everything we could about conservation easements. And in 1998, we placed ninety-five percent of the ranch under easement. In 2016, we gathered at the ranch once again to measure our progress, and to welcome a new generation of young adults (my two daughters and my sister’s two sons and two daughters) into this enterprise. My parents are both still living, and we are blessed to have three generations involved, ranging in age from twenty-one to ninety-one. Two facilitated weekend retreats led to the formulation of a new vision for the ranch, which in turn led to the development of a request for proposals from landscape architecture firms to create a new master plan for the property. Our new master plan will include a strategic partition of the land to allow for eventual non-profit ownership of a portion of the ranch where we intend to develop programs that will enable others to experience what we love about the ranch. Simultaneously, we are working on a plan to ensure the financial sustainability of our efforts. Years ago, I attended a session at a land conservation conference in which the panelists were all consultants working with landowning families. Memorably, one stated that whatever may be amiss within a family will inevitably rise to the surface when the subject is raised about the future of the land. This has to do with money, of course. But unlike some other financial assets, where families have direct ties to the land, there may be powerful emotional attachments as well. One way or another, those emotions, and other unresolved issues within the family system, are likely to emerge in the times when important decisions are being made about the land. This process has the potential to be divisive and destructive, causing pain that may reverberate through a family for generations to come. There is no one “good” outcome for a family wrestling with the future of their land. Partition, sale, and even development of the property may be the inevitable or even the best outcome. But a well-designed and facilitated process may lead to deeper understanding, and even healing, within a landowning family; and it may lead to outcomes that better meet the needs of everyone involved. I offer here a few insights gleaned from our efforts, which may be helpful to other families—landowners in Texas and beyond—and to those professionals advising them. My family decided to engage outside facilitation by professionals selected by the members with an ownership interest in the ranch. This action allowed family members to participate fully, and it removed the concern that a facilitating family member might push their agenda or attempt to predetermine a particular outcome. We chose Alexis Sanford of Austin and Margaret Vaughn of Houston for their expertise in creating a process that fostered trust and participation. Our facilitators spoke one-on-one (and in person when possible) with each family member as they designed our strategic visioning retreat. They asked us to consider whom in the family by virtue of interest, geography, age, or gender may have been excluded from the flow of information or decision-making. We considered what processes would be needed to ensure greater inclusivity and better communication going forward. They also discerned that within the younger generation, there were gaps in what family members knew about the ranch’s history and operations, and about our conservation efforts over the last thirty years. They advised, and we concurred, that we would need two-weekend retreats, one to ensure we had a shared understanding of our past and the reason for our work together, and the second to explore our dreams for the future. For the first retreat, we created binders with ownership and financial information, and we allowed several hours to present and answer questions about this material, as well as the activities and accomplishments of the last thirty years. Family members and master plan consultants reviewing property map of the Shield Ranch. We began the first retreat by welcoming the next generation into this ongoing effort. We acknowledged their busy lives, and we let them know that their involvement was welcome but not required or expected. We were also clear that while ultimate decisions regarding the ranches lay for now with the current owners (my mother, my sister, and myself), that there would be opportunities for real involvement and engagement for the next generation beginning now. Our facilitators devoted a block of the agenda to talk with us about the skills of listening and inquiry that would enable meaningful conversations throughout our time together. With the help of a graphics facilitator, we created a visual history of the ranch in which we populated the timeline with our unique experiences and memories of the ranch. One by one, over the course of that first weekend, we shared with one another our individual stories of the significance of the ranch to our lives. While our experiences of the ranch are vastly different, what emerged was the deep love and connection we each feel toward this place. We came to understand how much we all care about what happens here, and how central this place is to our experience together as a family. I believe that everyone felt this storytelling was the highlight of our time together during those two retreats. In one exercise, our facilitators had us go to a place on the ranch that held meaning to us personally and write a letter to the ranch. And they asked us to write the letter the ranch might draft to correspond with each of us. For some, this exercise led to profound insights, discoveries, and transformations. One member shared that he was on a journey from being a consumer of the ranch to become a guardian of the ranch. In our second visioning retreat we explored a wide range of possible future scenarios for the ranch. At the end of our time together, we refined our list and identified our top priorities, and we committed “to make it real.” We made lists of the gifts and skills we could each contribute going forward. Finally, we created working groups for each priority program area and populated those working groups with interested family members from all three generations. These groups have been meeting through 2017 to inform the evolving master plan. I have learned that the key to developing a compelling strategic vision as a family lies hidden in the power of generative listening: listening to the land, listening to the past, listening to our deepest longings and one another, and listening to what wants to and can be. 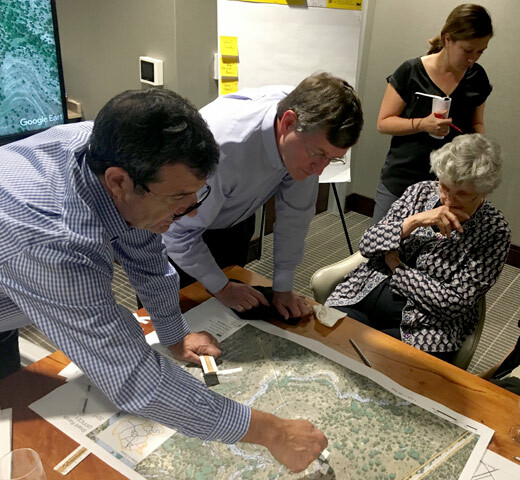 While every family and every property is unique, thoughtful planning may help a landowning family navigate this sometimes challenging terrain together, and may lead to novel opportunities for families to retain and conserve their land, where that is the desired future.